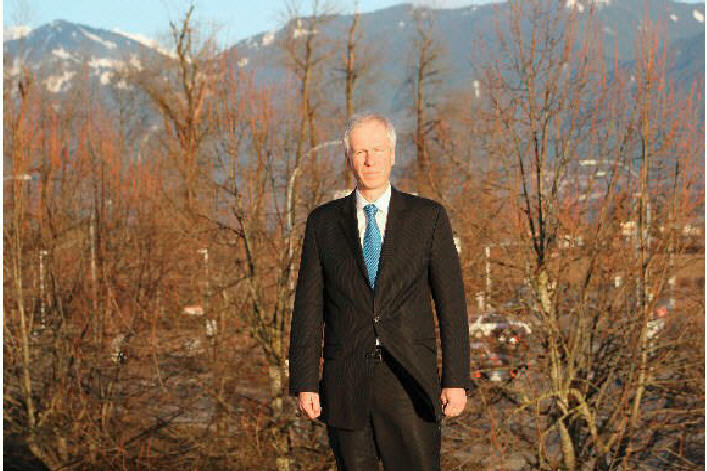 Liberal MP Stephane Dion, seen as one of Canada's greatest political thinkers of our time, looks west to BC's future from Soprema's green roof last Friday. téphane Maurice Dion, PC, MP is a Canadian politician who has been the Member of Parliament for the riding of Saint-Laurent–Cartierville in Montreal since 1996. Last Friday, the Voice had a chance to sit down with him for a one-on-one in a local constituency meeting room at Soprema on Yale Rd. How important is a senate to Canada, and do you support reforms in the Upper Chamber rather than abolishing it? The Fathers of Confederation wanted a sober, second thought chamber to scrutinize what the House of Commons was doing and to suggest improvements, amendments, ways to save money for taxpayers and ways to clarify the bills. If you look at the history of the country, they have done quite a good job at that. Before Mr. Harper came, about 1-out-of-10 Bills were amended by the senate. This doesn’t take into account the fact that senators were, at the outset, involved in the decision-making process. They were able to suggest to MP’s ways to improve their work before the Bill was going to the senate. So, that’s the role I want to protect, and what we Liberals want to protect — the role of having a chamber of scrutiny. Look at any mistakes the House may do, because senators who have more experience, they stay longer. The turnover is very rapid in the House because of the elections. Senators bring experience, and they will have time to look at that because they don’t have the work of the constituency, or the partisan work to do. It’s what we want to preserve and to enhance in asking senators to be part of a partisan caucus, to not have to be linked to party discipline, to not have to raise money for a party, to focus on the legislative work. Concrete examples, only one let’s say, a couple of years ago, the House sent an omnibus (Bill C-45) to the senate. Senators took the time to reflect carefully, and one (Liberal) senator, saw that in the corner of a page, the Bill was giving to the Minister of Heritage the power to exercise a lot of censorship on movies. So the senate amended the Bill and brought it back to the House and we said ‘thank you senators, we didn’t see that', and we accepted the amendment. This is the kind of thing that in a country like Canada it would be very helpful to protect instead of abolish. What Mr. Trudeau is proposing, to ask senators to focus on this legislative role to not be involved in raising any money like Mr. Duffy was doing and all this kind of stuff, will be helpful for the country. You need unanimity of provinces. There is no unanimity on it. The NDP are asking for something that is not realistic with electing the senate, making the senate elected. We need to be careful about two things; the first thing is do we want to elect the chambers, paralyzing each other, because today, if the senators are not elected they would give the last word on Bills to the House and they don’t have the legitimacy of a legislated mandate, MP’s have. If senators are elected, they’re elected with a mandate and will see no reason any more to give the last word to the House. So they will contradict the House and paralyze the democratic process. Do you know a country where it is happening? The United States. What is happening in the United States always? The White House and the two chambers of the Congress are fighting each other and they’re paralyzing the country, and the world. In the last three years, they were unable to come up with a budget. Do we want that in Canada? Of course not. If we have two elected chambers, we need to figure out the disputes and the mechanics between the two and this does not exist in our constitution. We need to amend the constitution a dispute resolution mechanism between the House of Commons and the Senate if we have two elected chambers. But here is an additional problem that I want to point out to the people of British Columbia; is that en elected senate as I just described would be powerful. Instead of contradicting the House once every two to five years, they would do that once every 2 weeks. This powerful senate then will highlight the problem that we have; that this senate is not well balanced regarding the number of senators by province. Do you know how many senators that you have in British Columbia? You’ve got six. How many senators have you got in New Brunswick? Ten. So, there’s not fair representation? No, because the senate’s history is all because of the fact that Europeans came from the east to the west. So at the time of confederation, Nova Scotia and New Brunswick had 10 senators each made sense because they were numerous. But today, each of these provinces is less numerous than British Columbia. So today, that British Columbia only has 6 senators and New Brunswick 10 is tolerable only because the senate is a useful but discrete roll. If the senate plays this full role because they are elected, Alberta and British Columbia are short-changed with 6 senators and it doesn’t make sense and will say ‘Give us more senators’ and then you have a constitutional crisis because I don’t know which province will give these two (each). Are you going to try and get more senators for BC? No, because you need to re-open the constitution. I don’t think the province of Quebec is ready to discuss just this issue. They will come with their own issues and then we are back to Meech in Charlottetown. What we need to do is to improve the senate without re-opening the constitution. The best way to do it is the Justin Trudeau way; ask the senate to be less partisan, to focus as its role as a sober second thought chamber, a chamber of scrutiny, and to not put us in a situation where a powerful senate would be terribly unfair of the two most western provinces of our country to have only 6 senators. Mr. Trudeau’s position does not include a request to re-open the constitution. It requests nothing more than a Bill in parliament where we say senators should not be part of caucuses, and that senators should focus on their role as chambers of scrutiny. Senators need to improve the work of the house. Let’s say you are an authentic Canadian. Authentic Canadians will say ‘Well okay, Alberta and British Columbia are more powerful in the House of Commons because their demography is growing. A share of MPs is decreasing for authentic Canadians. So why accept or see our share decreasing in the senate? They will resist that. Quebec will resist that. Quebecers will say we are a nation, and we should have half of the senators. Ontario is already very under-represented in the senate. Toronto. Many in Manitoba and Saskatewan and places up north have no senators. So it will be very difficult to solve as a problem. The solution to me, is to avoid the powerful senate, it would be too unfair for Alberta and British Columbia and improve the senate of scrutiny which we have today in a role, but a helpful role. But what I want to say is; Mr. Harper is hurting his own province and British Columbia. He’s willing to elect the senate without correcting the under-representations of senators in the senate. That’s terrible what he’s doing. Ask (Mark Strahl) why he wants to short-change British Columbia with the senate reform? Ask him why he wants to hurt his province this way? To me, the Senate Reform Bill is maybe the most dangerous bill to have in the House today. Hopefully, the second supreme court will stop them because the second court is …. To elect the senate you have to have seven provinces representing, 50 per cent of the population. The dollar has lost 10 per cent of its value over the last few months, what do you think needs to be done to stop the nose dive and try to get parity with the US dollar? If elected, how do you kick start the economy? Is deficit spending the answer to promoting growth? We have very few ways that we can influence it. I will come and go on the fact that the Canadian economy is not as strong as it should be. The unemployment rate now is higher in Canada than in the US. The economics of Mr. Harper and Mr. Flaherty is pretty disappointing. We have a growth of -1.5 per cent and it was lower than a year before. We’re not going on the right direction. They made a lot of mistakes. They put us in deficit before the recession started. Before. We need to keep that in mind. Today, Canadian households are more in debt than the US ones. The economic record is pretty disappointing and I think it’s time for a change. What about stimulus spending, will it fuel the deficit? Stimulus spending was needed. Do you remember we needed a monetary crisis in order to convince the government to do that? And it was not well thought out, it was not a very good stimulus spending program and they spent a lot of money on advertising instead of on programs — even on programs that did not exist. It’s incredible, but they advertised a program to get people training that was still in negotiations with provinces and then there is no agreement and even a year before it’s not sure. So they should have done better with their stimulus package. The DFO here on the Coast, or at least in Chilliwack, is somewhat of a dirty word. Somewhere around 18-20 Cohen Commission recommendation deadlines have come and gone without any being implemented, if the report's recommendations aren't being taken seriously, then has the $26 million spent on it been a complete waste of taxpayer money? It’s not a waste of money because the report still exists. What has been a waste of money are all the cuts they imposed to DFO and they kept its own science (secret). Science is examining, looking at what the Cohen Report is saying. The DFO does not have the same capacity that they did in the past, so many cuts have been imposed and scientists have been muzzled. Scientists need freedom in order to be effective. So they dismantled a lot of the scientific capacity of the federal government; DFO, Statistics Canada, and so on, and the result is that people are starting to lose confidence in the DFO’s capacity to address the problems of the fisheries. But I would not blame the science of the report. It's a fact that they don’t have the support from the government like they should. The Federal Liberal Party would do things differently? We would use fact-based data, scientific-based data. So there would be no muzzling of scientists? No, to the contrary. We will need them more than ever. Today in this community, people are concerned about clean air, clean water, the facility that’s to burn the waste in Vancouver, and what kind of pollution that means. Even the mayor, they did not have the right information, they didn’t know where to find it. Nobody spoke to them. It’s not acceptable. The Canadian Environmental Assessment Agency (CEAA) should not be dismantled. It should be a powerful body as is the Environmental Protection Agency in the United States. I have nothing against the Canadian Energy Board, but they don’t have the same expertise as the CEAA. So that’s one of the reasons why there can’t be growth in Canada when you don’t have the scientific capacity to make the development sustainable. Farmed salmon is a contentious issue here on the West Coast, would a Liberal government get rid of the net pens? We will not act with emotion on this. It’s very serious to protect the wildlife and the fishery and to allow the extent of fish farming. We will have to look at that fairly carefully and we need to assess it in the Cohen Report. Does the Liberal Party support the Keystone and Enbridge pipelines? But, we said to the Americans if the environmental assessments are positive, then 'let’s go'. We are supporting it. Why are we supporting it? Because, it’s economic development and if not by pipeline, then by trucks and trains and by barges. And those methods are not as safe as a pipeline. The music industry has taken quite a hit with digital streaming. Is enough being done to help prop it up? That’s quite true. They lost 20 per cent in the last four years. I’m not sure. That’s why as a member of the Heritage House Committee, I have requested that we conduct a study on the music industry of Canada with the new challenges, with the new technologies and will start next week. Musicians are in trouble and we need to see if the help they receive from the federal government needs to be adapted. So this $25 million Canadian Music Fund is not enough? Maybe it’s enough. Maybe it’s a way we allocate the money. Maybe it’s the kind of regulations that we have to see how we may help the industry to adapt to technologies. They have a lot of difficulties now to earn enough money and you also have the matter of property rights and we think that in the coming weeks the committee — which I am a member of — who will focus on this issue. Doctor-assisted suicide was one of the 100 resolutions that was made by delegates at your national convention. You voted in support, but your current leader has yet to take a stance on that. Mr. Trudeau will have to as a leader, decide the electoral platform. But he knows that the party supports it. So, of all these resolutions, which ones will be the mandate of a Trudeau government? Do you think there should be an age limit on euthanasia? Oh yes. You need to have a careful regulation like the ones they have in Quebec and the laws you have in Belgium. You cannot regulate this issue. You need to help people in awful pain, but at the same time you need to see that it’s done properly. You’re speaking about life. It’s a very serious issue. If elected, will Liberals slap on what’s being called a “Trudeau Tax” to pay for programs and incentives? Mr. Trudeau said he will not raise taxes. He said that. The Conservatives are very good at pretending to write a platform for ourselves. We will write in our platform that there will not be any tax increases. And you’re not going to touch the GST? No. He (Trudeau) said that. They cut the transfer payments to the provinces for health. They made a lot of blinded cuts so we anticipate a surplus. Should there be a national inquiry into the murdered and missing aboriginal women? Yes, we are requesting that year-after-year. Of course, we should have one. I don’t understand they don’t want that one and do the right thing. Given the Snowden revelations about the NSA, do you think the Canadian government is overstepping the boundaries in spying on Canadian citizens? Yes. Before they decided to weaken Statistics Canada, and the long-form census, in order to protect our privacy, which was a stupid view, and completely ideological from them. Now, they are closing their eyes about this issue. What we are asking for is to have a committee of the House who will look at it as they had that in the United States and Great Britain and Canada or they will do it again. So we are committed to do that if we are the government; we will have MPs on oath who have the responsibility to watch the watcher. Your MPs will be responsible to ensure that your privacy is protected. Some people feel that Justin Trudeau doesn’t have the economic background in order to lead the party. Is there any substance to that? No. I think Mr. Trudeau, has the right values, the sincerity, the support of a lot of people in Canada and he’s leading a strong team that have expertise on different files. And he’s a good listener. So he will listen to the best experts that he will have around him when you think of Ralph Goodale, John McCallum, Scott Brison. On military procurement, a general is coming with us. He knows a lot about this file while the Conservatives have been so bad to manage the military culture. Do you think the general abused the Integrated Relocation Fund when it cost $72,000 to move him 6 blocks? It shows how nervous the Conservatives are to attack a man who gave his life for his country like that. But do you think $72,000 is overcharging? How many of the other generals did the same? It was part of the rules that when you give your life for the nation, we’ll help you to move to your new house. He was not involved. He wasn’t the one who decided it will be $72,000, so I think it’s a cheap shot from the conservatives. When they don’t know how to answer you about the substance, they attack your character. They always do that. The Conservatives leaked that information? We have no proof of that, but it came as a surprise when we were having our convention. The minister needs to explain how come a leak like this came out. They were so willing to attack the general with a leak. When you’re the Minister of Justice you would ask, how come a leak came. I would have an inquiry. They wanted to have an inquiry on the general. But anyway, I’m very pleased that he is coming because of the procurement in Canada now. The procurement on all their files is an embarrassment to the country. It’s hurting the economy and to have men and women in uniform to have the good equipment, so we need to do a much better job on this issue. Mr. Trudeau is trying to find the best experts on every file to offer Canadians under the strong leadership of his own. I’m going to help the team as much as I can and I’m glad to be here today in your beautiful region.